Just a quick post today as I am most definitely running late for work - but day three of my working week! This pink dress I recently got from Warehouse in the sale (you can find it in the link below) and I am obsessed! I don't often wear pink (especially to work) but this dress is the perfect style and fit. They also have this in a skirt and top alternative which is also in the sale if you wanted to mix and match! Something which I am definitely debating considering how obsessed I already am with this! 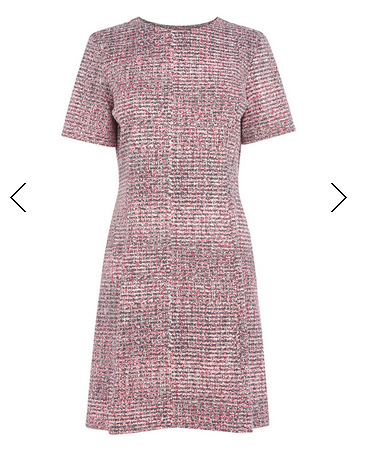 I absolutely love this tweed style dress!! You look like you are straight from a Twiggy photo shoot!! Love this look lovely!! Already obsessed with your blog!! Definitely a great work purchase, dresses are so much better than shirts and pants!! I love the texture of this dress! Thanks for linking up. Very Elle Woods in Legally Blonde. Gorgeous dress. What a sweet dress especially when its pink! Would you like to follow each other on GFC, Google+, Bloglovin and other social media? Keep in touch. I love this dress. If i saw it on the hanger i wouldn't think much of it but seeing it on you looks gorgeous and now i want it :-) love your blog, i am now following.